Life's Journey To Perfection: 2016 LDS Sharing Time Ideas for November Week 4: Reverence for God helps me respect and love others. 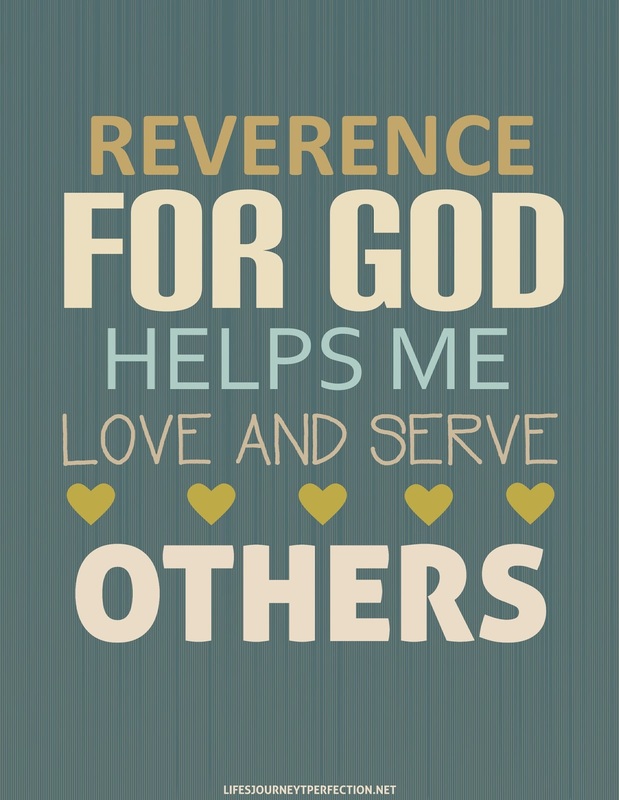 November Week 4 Topic: Reverence for God helps me respect and love others. To begin Sharing Time, show the primary children the week's theme poster and invite the primary children to repeat, "Reverence for God helps me respect and love others." Divide the primary into four groups. If you have a really large primary you could divide into eight groups and just do double the pictures. Give each group one of the four posters. (Before primary print the posters from the download above and paste them onto half sheets of poster board. If you don't have poster board, tape another blank paper onto the bottom of the printable). Invite the primary children to read what is on their poster and then draw a picture that would represent what the poster says. When each group has finished their poster invite them one at a time (starting with poster 1) to come up read what is on their poster and discuss with the rest of the primary about their drawing. Continue with each group. When each group has discussed their posters, invite the primary children to sing, "Reverence is Love". For the last part of Sharing Time, explain to the primary children that as we show reverence for Heavenly Father, we will love Him and have the desire to serve Him. Explain that in Mosiah 2:17, King Benjamin teaches that, "...when ye are in the service of your fellow beings ye are only in the service of your God." So, if we love our Heavenly Father, we are going to want to love, respect and serve others. Invite the primary children to share ways they can show respect and love for others. Discussion might include, being a friend to everyone; respecting our teachers and parents; visiting those who are lonely; seeing each person we meet, as a child of God; etc. Close by sharing your testimony on the topic and invite the primary children to both, show reverence towards their Heavenly Father as well as look for ways to show respect and love for others. Thank you so much! This is a great idea!